KEY FEATURES: To 23cm. Body dark brown; head, neck & throat black, underparts paler brown to almost white under tail & stomach. Wings darker than body with large white patch (visible in flight); tail also dark with terminal white bar. Behind & under the eye the skin is naked & yellow. Eyes brown. Legs yellow. 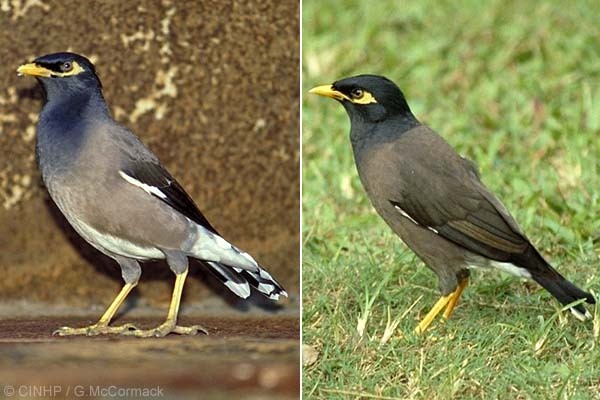 SIMILAR SPECIES: Jungle Mynah (Acridotheres fuscus) lacks the yellow patch of bare skin behind the eye, has a distinctive "nasal tuft" of feathers at the base of the orange beak. Eye yellow. Legs orange. 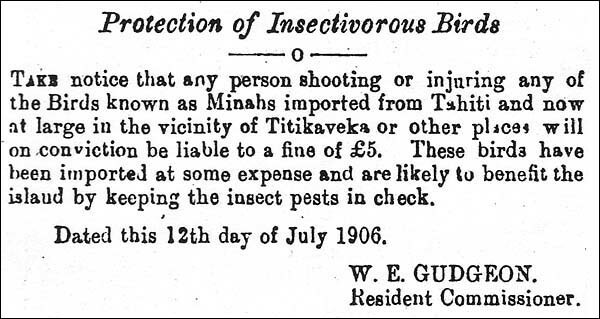 POSITIVE SIGNIFICANCE: Biocontrol - released 1906. Comments: Recent, Naturalised. NEGATIVE SIGNIFICANCE: Serious invasive, and serious agricultural pest. Comments: NBSAP - Te Au-o-Tonga (10 of 11 animal pests), NBSAP - Puaikura (12 of 12 animal pests), NBSAP - Mauke (9 of 10 animals), NBSAP - Atiu (1 of 4 wild pests) One of world's 100 invasive alien species [ISSG,2001]. GENERAL NOTE: Acridotheres translates as: Grasshopper hunter. Special Reference: Watling, D. Birds of Fiji, Tonga & Samoa. (1982) Millwood Press, Wellington, New Zealand; p104.